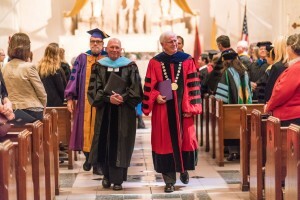 Saint Mary’s College of California in Moraga honored Brother Thomas Johnson, FSC, director of the Regional Novitiate, with an honorary doctoral degree. The recognition on April 13, 2016, at the annual De La Salle Week Convocation was part of Saint Mary’s Founder’s Week Celebration. Prior to serving as Novitiate director, Brother Tom served as Vicar General for the Institute from 2007-2014. He began his service in the classroom and as an administrator before becoming Visitor of the Chicago District, where he led the merging of three Districts into today’s Midwest District. After serving as Visitor of the Midwest District from 1995-2001, he served as Regional Coordinator at Christian Brothers Conference from 2002-2007 before being called to the Institute. 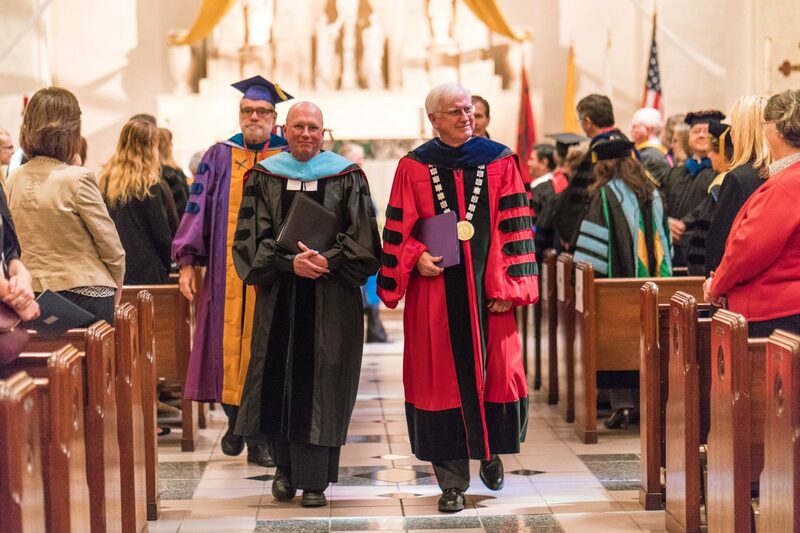 The convocation that honored Brother Tom is the centerpiece of a weeklong celebration of the life of Saint John Baptist de La Salle. In addition to the convocation, De La Salle Week included a symposium on the impact of Lasallian academic research, which featured a keynote address by the director of Lasallian Research at the Institute, Brother Diego Munoz, FSC. De La Salle Week activities also include a 5k run for hunger, community masses, and a fair trade and social justice festival.